Planning to Ring in a Healthier New Year? Are you thinking about making resolutions in 2015 to get healthier? Well, if you’re a nutraceuticals retailer, you’re counting on it. Consumers across all age groups are continually seeking ways to maintain and improve their health. This trend, coupled with increasing health care costs, an aging Baby Boomer population and a rising interest in health and wellness through diet has fueled the growth in the nutraceuticals market. Consumers are looking for innovative products that deliver wellness benefits to help them lead more healthy and active lifestyles. As people are striving to be as healthy as possible to get the most out of life, the use of nutraceuticals to achieve desirable health outcomes has seen tremendous growth and financial success. The nutraceuticals market has become very competitive with price, safety, efficacy, supply and packaging all playing a role in a retailer’s ability to succeed. Merchandising, inventory management and sourcing are keys to success as large, multi-channel chains with private-label brands, pharmaceutical companies, small local suppliers and retailers compete for business. Getting physician and health care provider buy in along with regulatory support can definitely help to promote your products. The right technology can help you understand and respond to consumer demands. Technology can you immediate access to data across the entire operation so you can streamline business operations, and gain a competitive edge. To reach the largest number of potential consumers, you need to be visible across multiple channels. The Internet continues to be an important tool for opening new – and expanding existing –business channels. What is essential at the retail level is coordination, integration and accurate information management to operate successfully. Nutraceuticals management often requires lot control and a full history of tracking to record when and where lots are shipped for research or for the unthinkable, a recall situation. For such an extreme situation, you’ll need to track all inventory by lot and serial number and be able to trace the lots back to the suppliers through outsourcers or contract manufacturers. You may also need to trace this to individual customers thus needing to capture this data on an ongoing basis to be able to respond without hesitation. Certain products may require temperature-controlled storage and retailers must be able to recognize and stock these items accordingly. With visibility and control of inventory, you’ll have better control over order response time, you can better manage inventory allocation and you can create a seamless process for order fulfillment ensuring that you have the right products, at the right time, ready to ship to meet customer expectations. So, while consumers resolve to get healthy in 2015, you can get your business health on track with the right technology to drive success. If you rely on the Magento eCommerce platform, see how you can Get The Most Out of Your Magento Investment. Watch this 30 minute webinar featuring Freestyle Commerce and Magento. Click Here to register for access. Apparel retailers selling across multiple sales channels realize that managing inventory in one place helps to avoid stock-outs [or double-selling] and lends to better analysis of products in terms of performance, peak selling periods, etc. More importantly, centralizing the management of sales channels allows for more accurate inventory calculations. When you run a product based business selling apparel and accessories, it’s critical to know when you need to re-order, and you don’t want that to be when you have nothing left to sell! Establishing low level points will give you enough time to re-order before you reach an empty bin and, worse, start disappointing prospective customers with a back order or ‘out of stock’ order status. If you’re selling your products across multiple sales channels such as your website, Amazon, eBay and more, you need visibility across all channels. Generally speaking, your website analytics will give you statistics regarding products sold directly through your web store. If you also sell through Amazon, for example, your web store won’t have visibility into your Amazon inventory levels from your web store. By managing inventory across all channels in one solution with a ‘best of breed’ order and inventory management solution, you can rest assured that the ‘available to sell’ levels that are sync’d to each channel are accurate. According to Software Advice, 95% of the prospective inventory software buyers they spoke with were also first-time buyers. 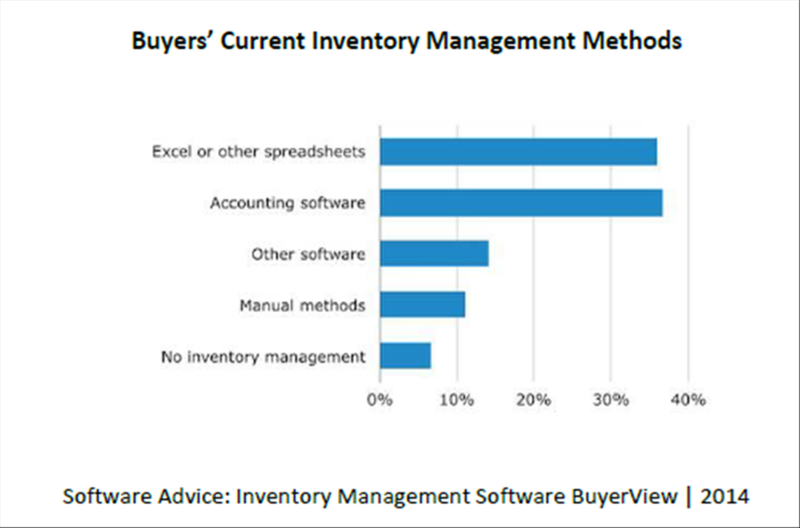 Of that, 36% were using accounting software to manage their inventory, while 35% were using Excel or another spreadsheet method. Another 11% were using what they called “manual methods”, which often referred to the good old pen and paper method. Those buyers using any of the above methods are the kinds of people we speak to daily who love the fact that their business is growing, but hate the headaches this growth brings if they don’t have the proper systems in place. They are looking to ease these pains so they can enjoy their success! The last thing an online apparel retailer needs is to have too much inventory on hand and too few orders coming in, leading to reduced margins. Excessive inventory ties up cash that could have been invested in enhancing your eCommerce store, or boosting your marketing efforts to drive additional revenue. At the same time, not having enough inventory on hand results in stock-outs, backorders, cancellations, and lost customers. It’s a balancing act and it is a major issue for all companies. Streamlining essential back-office inventory and order management processes supports current and future growth. With manual processes in place, there tend to be bottlenecks that occur as business starts to take off, hindering growth potential. An Order Management Solution (OMS) automates inventory and order processing so you can fulfill orders faster and easier, get a handle on inventory levels and leverage better data to make smarter decisions. It’s all about enabling efficiency, productivity and insight to drive business growth. What could be better than that? How about more of that! More efficiency, productivity and insight is exactly what you’ll get when you take advantage of the synergy between your OMS and electronic data interchange (EDI) software. You’ve probably heard of EDI because many of the retailers, suppliers and 3PL providers in your supply chain ecosystem are already using it—or looking to use it—to get data moving faster. EDI is the common “language” that enables everyone to track goods and data, from start to finish, quickly and elegantly. Being part of the conversation saves you time and money and makes you easier to do business with. Here’s an example of how using an OMS with EDI can accelerate order processing and cut transaction costs: when you receive a non-EDI invoice from a vendor, you need to pay someone to manually print it out, key the order data into your OMS, and look through the data line-by-line to check it and flag any exceptions, such as a price change. With EDI, all that extra labor cost and potential for errors and delays disappears. It’s all processed and reconciled automatically within the OMS. This is why supply chain giants like Amazon all integrate EDI with their financial systems and mandate that their suppliers use EDI—because it lets them ship next-day (or even same-day) and also saves on procurement costs. What business benefits do you get from using EDI alongside your OMS? Faster time-to-market. Automated order processing is not only much faster, but also offers better visibility into inventory. When you know what your vendors have available you can work with them to eliminate distribution bottlenecks and ship faster. Higher margins. Obviously automation saves on labor costs. It also improves accuracy of information, which means fewer costly and reputation-damaging problems with orders. You won’t get a crate of rubber ducks because someone mistyped a SKU number. Better analytics. When you’re tracking (and monetizing) supply chain data you can begin to see and proactively work with “trigger” events, from weather to cycles in supporting industries, that impact your sales volume. Faster turnaround time on payments. Because EDI data is electronically available across your systems, as well as those of your vendors and customers that use EDI, payment can happen much faster. Competitive differentiation. Data accuracy and timeliness are critical to success in retail. EDI/OMS integration helps give you end-to-end visibility across your supply chain. When you can see what the customer’s experience looks like, you can set the bar for service where Amazon sets it. Peace of mind. With EDI you get a one-stop vendor relationship with full visibility end-to-end across your solution. That eliminates finger-pointing and accelerates resolution of issues. View our on demand webinar, by our preferred EDI provider, HighJump TrueCommerce EDI, entitled Incorporating EDI into Your Business to learn more. Managing Inventory & Order Fulfillment – Exciting, No. Necessary, Yes! Managing inventory and order fulfillment isn’t the most exciting part of becoming an eCommerce merchant, but it can make or break a web store’s operations. If you’re not managing inventory efficiently, you risk tying up funds in excess inventory or worse -losing out on a sale due to a stock out situation and ultimately letting your customers down. When done well, efficient inventory and order management can help streamline your business processes, optimizing your cash flow and improving your bottom line. Managing inventory is a delicate balancing act for businesses of all sizes, small and large. If you have too much invested in inventory in stock, you’ll have less money to run the rest of your business. If you have too little on-hand, you could lose out on sales and risk losing potential customers. The tips below offer some advice on how to find that happy balance. Determining Inventory Amounts – To help you determine the right amount of inventory to keep on-hand it’s important to carefully track sales, monitor trends and analyze your performance over the past few years to help you more accurately forecast inventory needs relative to sales cycles. Other things to consider include what sells and what doesn’t, what items are more seasonal than others, and what the inventory turn is on your most important products (the time it takes to sell that product and restock it). Get Your (Ware)house In Order – You have to get your house in order, or in this case your warehouse, in order to run a smooth operation. Making sure your products are stocked efficiently and that you have clear guidelines on how to pick/pack/ship items will ensure items get shipped quickly and tracked accurately. Make Sure Marketing & Operations Are Aligned – When determining your stock levels it’s also important to make sure your purchasing and operations teams are aware of the promotional calendar marketing has in place. For example, if marketing is running a promotion next week or next month, you may need to order and stock more of a particular item(s) to meet the anticipated demand. Have Backup Vendors – As a customer, there’s nothing more disappointing than to place an order and then later find out it’s been put on backorder because the item isn’t in stock! As the merchant you can take preventive steps to avoid this situation by having a backup vendor as your ‘go-to’ if your primary vendor runs out of stock. You may not have a backup for every product you sell, but for those you consider to be the ‘hot sellers’, whether all the time or during peak seasons, it would be beneficial to have a backup vendor. Get Help! – The best way to ensure you manage your inventory and order fulfillment processes efficiently is to automate the process using an inventory and order management software solution. With our inventory and order management solutions for small to mid-sized businesses you can manage your inventory, orders, and returns across multiple sales channels, send purchase orders to suppliers, process shipments including drop ship items, produce management level reporting, and more. Our solutions provide you with the tools to streamline your operations by automating your processes. In addition, our solutions seamlessly integrate with QuickBooks, the preferred accounting solution choice of small to mid-sized retailers. Sign Up for a Free Trial of our Inventory & Order Management Solutions today! Are you having trouble managing your inventory? Have you run into the dreaded ‘out of stock’ situation more than you’d like? Or on the flip side, do you have so much excess inventory on-hand that it’s affecting your profit margins? If any of these sound familiar, it may be time to start looking into an inventory management solution to help you get your order and inventory processes under control. But with all the options available today, how do you know which solution will work best for you and your business? And what features should you be looking for? – Adding sales channels or marketplaces is a fast and effective way to grow your business, if you have the tools to manage them successfully. Having the ability to bring orders from all channels into one solution, where you can process the orders, manage the inventory, and publish updated ‘available to sell’ levels back to your sales channels, ensures you don’t oversell a low inventory level product. It also saves you time by centralizing your workflow and eliminating the need to update various systems. With an effective order management solution, inventory and order updates would be automatically published back to all sales channels. – Increasing the number of daily orders you receive is exciting, but it can also lead to bottlenecks if you’re not positioned to process and fulfill those orders efficiently. Retailers who are processing a higher volume of orders look to streamline their processes even more by implementing barcoding and scanning at the pick/pack/ship stages. – While an accounting system can’t do the work of a specialized order an inventory management system, it is necessary to run a successful business. Having a direct integration to your accounting package from an order and inventory management system makes all the difference. It enables you to easily post to your General Ledger account and keep track of all your other business expenses outside of inventory. – Many retailers have added kits or bundles to their product mix, meaning the product for sale is not a single item, but a combination of products sold as a kit or bundle such as a gift basket or a collection of items in a set. Managing these types of products is more complex from an inventory standpoint. With an inventory management solution that supports kitted products, you can see how many kits can be assembled, what ‘kit’ items need to be re-ordered, etc. If you think you can benefit from implementing a solution with the features listed above, give us a call. Or Sign Up for a Free Trial of our Inventory & Order Management Solutions. Why Are You Still Making Manual Updates? Automation Can Make Your Life So Much Easier! We speak with retailers who call in to discuss their pain points, and 9 times out of 10, their challenges are related to inventory. What amazes me though, is that so many of those retailers are in pain because they’re still running their business using manual processes, like using spreadsheets! With all the solutions out there, it’s hard to believe so many retailers are still running their businesses using inefficient and error prone manual processes. Some have managed to be very successful and find themselves at a crossroad. They’ve reached the point where their success is jeopardizing their growth potential. They have the “good problem” where they can’t keep up with processing orders and managing inventory; particularly those that are selling across multiple sales channels. This is when we hear from many of the small and mid-sized retailers too. They’ve reached that ‘tipping point’ where they can’t grow further until they figure out how to get ahead of the order to fulfillment processing curve. In addition to being time consuming, error prone and overall inefficient, manual updates are expensive! It’s time to find a better way of doing things to keep up and to grow! If you’re still making manual updates to support key retail back office processes, you’re throwing money, and profit, out the window. Your time is valuable, and spending time manually adding and updating information is costing you more than you think. And if you’re working in multiple sales channels, and have to log and track information for each separately, it’s even worse! If you’re using spreadsheets to track inventory and publish your available-to-sell levels, I’ve got bad news for you, you’re always going to be out of sync! Sales happen in real time, inventory decreases in real time, but how often are you updating your spreadsheets? Chances are you don’t have an employee on-hand whose sole purpose is to instantly update spreadsheets and publish those new levels as orders come in. Most likely you’re making updates at the end of the day, or for some it’s done at the end of the week, and this can lead to problems. When you finally get around to it, you may find that you are actually out of stock on a particular item and have to call your customer(s) with the disappointing news that his/her order cannot be fulfilled. Retail is tough, and the last thing you want to do is disappoint a customer. Not only do you risk a sale, but also a potential repeat customer. So how do you solve this? Once again, through automation! Automating the synchronization of your inventory across all sales channels offers many benefits: improves your ability to make customers happy by always having accurate available-to-sell levels, gives you real-time visibility into your sales and inventory, saves you the time and effort associated with manual efforts, and helps you better manage the cost of inventory because you’ll have a better handle on how much inventory to keep on-hand at all times. So What Are You Waiting For? Automation Is Where It’s At! Like I said, retail is tough but it can be so rewarding. There is a lot of competition out there so it’s important to get an edge over the competition, and automation can give you that edge. Using an inventory and order management software solution not only ensures you have accurate available-to-sell levels published at all times but frees up time, money and assets you can use to focus on growing your business. Whether you sell online, through brick and mortar stores, catalogs, etc. or a combination of a few channels, we have a solution. Register for a Demo of our Inventory & Order Management Solutions today and see for yourself. If you have a retail business, chances are you have, or are looking to have, an online presence as well. In today’s world, it’s mandatory to have a website for branding and exposure if you want the business to grow. And having a shopping cart enabled website to allow you to sell product is an easy way to expand your presence on a national or even global scale with minimal capital investment and overhead. But having a website alone isn’t always enough. Adding additional sales channels, like selling online, selling on Amazon or any number of the popular sales channels, brings a lot of advantages in terms easily expanding your presence, but it can also bring a lot of headaches if your sales channels aren’t managed properly. This is where an inventory and order management solution can help! Implementing an inventory and order management software solution can help you streamline your business processes and position your business for greater success in the future. One of the biggest ways you can benefit from a solution is through the automation of your order fulfillment processes. You want to have as few steps as possible between the time a customer places an order to the time they receive their order to ensure timely delivery and make your customers happy. Therefore, you need to eliminate as many manual steps as possible because those steps can not only affect your delivery times, but can also lend to manual entry mistakes which can lead to even longer delays. Placing orders through suppliers and receiving the inventory back into your operation is also made easier when working with a solution that allows you to manage suppliers and send Purchase Orders. You can set up product low level alerts within the system to set automatic re-order points – this makes purchasing products even easier! And this same method applies to products you drop ship as well. From an inventory standpoint, having a solution in place is an absolute must, especially when working in multiple sales channels. Having the right amount of inventory on-hand at all times is a delicate balancing act. Having a product that ‘sells out’ is good in one way as it proves that it’s a hot item. On the other hand you never want to run out of stock and lose a potential sale. Carefully tracking your inventory not only gives you insight to your customers’ preferences, but helps in determining how much to have at all times. Finally, having an inventory and order management solution can help you manage all of your sales channels in one solution, giving you the ‘big picture’ in terms of how your business is performing. It’s much easier to analyze trends and buying patterns and make strategic business decisions when you have a single vantage point to see everything from a revenue standpoint, purchase orders, refunds and anything else related to your bottom line. So whether you are adding a new sales channel for the first time or expanding into more sales channels, life is so much easier when you have an inventory and order management solution in place. Automating the order fulfillment and inventory management processes makes just about everything related to your business as streamlined and simplified as possible so you can focus on the more important things – like growing your business! Learn more ways to drive your retail sales growth in the ‘7 Retail Operational Improvements That Make A Difference’ eBook.